Easily Cuba’s most famous private “paladar” restaurant, La Guarida served its delectable cuisine to a host of visiting dignitaries, including the King and Queen of Spain, movie actor Jack Nicholson, Nobel laureate Gabriel García Márquez, and, of course, to yours truly. This tradition seems to have ended last week when the famed Cuban paladar was forced to close its doors. The reason for La Guarida’s great success and popularity begins with the fact that it is located in the apartment in where the wildly successful, breakthrough Cuban film "Fresa y Chocolate" (Strawberry and Chocolate) was filmed in 1993. 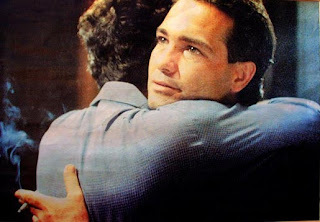 Co-directed by Cuba’s late master filmmaker, Tomás “Titón” Gutiérrez Alea, together with Juan Carlos Tabío, the film treated the taboo subject of homosexuality in socialist Cuba in a sensitive and sympathetic way. (Go here to view a great 5-minute clip from the film). Roughly translated as “The Hideout,” the restaurant’s name originates with the nickname Diego, the homosexual character in the film, gave to his own third-floor apartment in the building. (He also nicknamed his hardworking American refirgerator "Rocco," which will be the subject of a future post in this series). The founder, owner, and operator of La Guarida, the affable entrepreneur Enrique Núñez (pictured to the left with his wife), jumped on this opportunity after the film became a world-wide success, initially converting a small part of what had been his parents’ third third-floor apartment in this truly impressive ruin of a building into what up to last week was Cuba’s most renowned paladar. In our interview, Enrique explained that following the international release of the film, foreigners began to show up unannounced at the third floor apartment to get a glimpse of the place where the film had been staged. 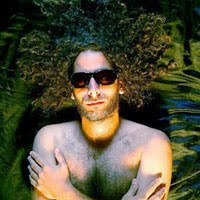 Cuba’s film institute, ICAIC, put his parents up in a separate apartment for the three months it took to shoot the film. After this (early 1993), his parents returned to their apartment and resumed a normal life, unaware of the success the film was destined to have or of the way that success would ultimately effect their lives. Enrique even admitted that at that point it never crossed his mind that he could later turn the apartment into a successful private restaurant. My good friend, Sam Farber (pictured to the left), old school New York Juban, political scientist professor emeritus at Brooklyn College, and proud socialist critic of the Cuban regime, sent me news on Sunday of the following declaration. "Intellectuals and Academics on the Island Protest Against 'Obstructions and Prohibitions' of the Government" (see the full story in Spanish at Diario de Cuba and see the full text of the declaration itself in Spanish at the Observatorio Crítico blog here or at KaosenlaRed.net). My translation of the declaration follows along with a few photos of some of the letter's signers (in this case, 6 youthful Cubans, each of whom has his or her own blog/diary at Havana Times.org). In the time it took me to receive, read, and translate the document into English over the past few days, a number of reactions to it have already appeared in cyberspace. As usual, one of the most interesting and provocative reactions is the one posted just a few hours ago by Yoani Sanchez at Generacion Y, "¿Qué hiciste cuándo vinieron buscando al inconforme?" (for the English version, "What did you do when they came looking for the nonconformist?"). "In order to put this idea in the proper context, I would like to ask those who have signed this document if they will remain silent when they come looking for a 'counter-revolutionary,' a 'worm,' or a 'dissident'; if they will be among those who target the victims at the repudiation attacks or among those who defend them." These virtual polemics, debates, and conversations are a great sign of the increasing public profile of the richness and diversity of opinion in a country often mistakenly thought to be monolithic. They are also a sign that Cubans (especially young and computer literate Cubans) are actively contributing to the deepening of Cuba's so-far mostly virtual civil society. Photo of "Rocco," the nickname of the Diego's old faithful Frigidaire refrigerator, being laid to rest at an art show in Havana in 2006 during the revolucion energetica. 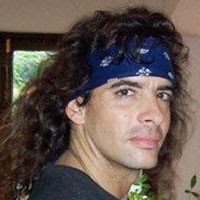 Rocco was the only "American" character in the 1994 Cuban film "Strawberry and Chocolate". The famed Cuban restaurant, La Guarida, inspired by the even more famous film "Fresa y Chocolate" has closed. "The emblematic Havana restaurant La Guarida closed its doors today for good. It was perhaps the last paladar that remained with a certain level of quality and attention, and doubtless the best known... La Guarida survived almost everything, but in the end the government's hachet fell and cut it to pieces, giving its owner a final chance to close it today and avoid jail and a painful bureaucratic process..."
"Above all, I think about the old gentleman who looked after the cars at the entrance to the paladar, and the lady who washed the dishes, now left without work, and especially the children of Juan Carlos. Possibly they have understood, given the example of the Hurón Azul, that in order to prosper one must get off this Island." Her post also embedded a truly fascinating and deeply disturbing Power Point presentatioin put together by state prosecuters of economic crimes against the owner. It reads like the script of an episode of "The Twilight Zone." Pop quiz for Christmas: Match each of the following statements with their original authors? 1. "From each according to their ability, to each according to their need." 2. "From each according to their ability, to each according to their work." 3. "El que parte y reparte coge la mayor (y mejor) parte." 4. "El ojo del amo engorda el caballo." 5. "Unfortunately, in Cuban state enterprises the employees only pretend to work, but of course that's because the government only pretends to pay them." Answer key at the end of this post. As a Christmas present, Fernando Ravsberg of BBC gives us a new entry in his blog, "Cartas desde Cuba." Entitled, "Passive Resistance," the post chronicles the potential impacts of the Cuban National Assembly's recent unanimous vote (who knew?) to force all state enterprises to begin self-financing over the next year. This means enterprises turning a profit will be allowed to keep a greater portion of their profits, which are now used to prop up enterprises that chronically operate at a loss. The above pop quiz is a rough reflection of some of the great Cuban economic aphorisms that raced through my mind as I read Ravsberg's perceptive words; one-liners that I have heard from the island's residents over the years to sarcastically describe (con uso agudo del choteo) the often mysterious ways they make their pan de cada dia (daily bread). Erasmo Calzadilla's latest post, "Insufficient Arguments against Yoani," at The Havana Times is not so much a defense of Sanchez herself, as it is a criticism of the attack article, "Yoani, la hija de PRISA," written against her by Enrique Ubieta that appeared recently in the pages of Granma Intarnacional (both on-line and in the Spanish language print version) on November 27. While I have criticized that article myself at length (here, here, and here), unlike Calzadilla I am not Cuban, do not live in Cuba, and thus am not subject to its leaders or laws. So, in Part II of this post on Calzadilla and the burgeoning Cuban blogosphere, let me share my analysis of his words and ideas. Calzadilla begins by reminding his readers that Sanchez's blog Generacion Y is blocked in Cuba. Still, he has been able to read many of her writings (he does not say how) and finds Ubieta's claims against her unconvincing and unfounded by any evidence so far presented. Indeed, in his reading of Generacion Y, Calzadilla does not find anything "that threatens the civil norms of coexistence in a society of democratic rights and responsibilities, as Cuba is said to be." New blogs are appearing weekly and new groups and portals promoting and hosting those blogs are proliferating rapidly despite, or perhaps because of the Cuban government's simultaneous repression of some blogs and promotion of others. Introducing Erasmo Calzadilla of The Havana Times. Thanks to the advice of Carlos Alzuguary that was the subject of one of my previous posts, I recently discovered The Havana Times.org, an English-language news and culture portal that was founded in Cuba in October 2008. Originally run from Cuba as a kind of "private venture" by the state-employed, foreign-born interpreter Circles Robinson (yes, that seems to be his real name), the site is now operated out of Nicaragua, where the Robinson lives after losing his job in Cuba. 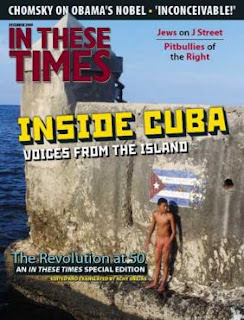 In fact, with the owner based in Nicaragua, the web master living in Spain, the writers reporting from Cuba, and the translators working mostly from the United States, The Havana Times is a true "transnational" operation that illustrates the power of the web in overcoming low budgets and long distances. While I will have more to say about this on-line portal in my on-going series of posts Let a Thousand Bloggers Bloom, here I only want to introduce and highlight a number of recent posts by blogger Erasmo Calzadilla (pictured above). Calzadilla's blog/diary is available at The Havana Times in both English and Spanish. 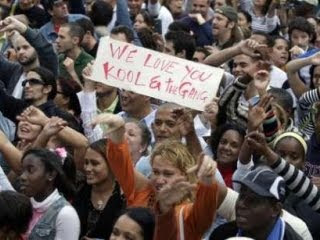 20-something years ago, Teresa Contreras started a "Kool and the Gang" fan club in Havana. That was back when she was just a sweet sixteen. Though she won't say exactly how old she is now, MSNBC reports that the club is still going strong with 148 members but that you have to be at least 35 to join! I'd just make the cut. They meet once a month in Contreras' house to boggie down to the oldies. Of course, they cancelled this month's meeting in lieu of the fact that the American group got its funk on for more than 100,000 groovin' Cubans at Havana's seaside "Protest-o-dromo" (otherwise known as the Plaza Anti-Imperialista Jose Marti). But you gotta love MSNBC for mis-identifying it as the "Imperialist Plaza." Here's the original caption that went along with the above photo: Fans sing during a concert of US band Kool & the Gang at the imperialist Plaza in Havana, Sunday, Dec. 20, 2009. The band became one of the few U.S. musical groups to play in Cuba recently, despite Washington's travel restrictions and the island's communist government's ambivalence toward Rock and Roll, Hip Hop, and other kinds of American music (AP Photo/Ariana Cubillos). Reports on the concert are all over the web and seem to have at least temporarily overshadowed the news of Raul's weekend speech to members of the Cuban National Assembly (see here and here). While he had pointed words for the U.S. in the wake of the arrest of a U.S. contractor in Havana two weeks ago, he did reitterate his government's "sincere willingness to definitively settle its differences with the United States, starting from a respectful dialogue, between equals, on any issue, without detriment to our independence, sovereignty and self-determination." Mentioning Secretary-of-State Hillary Clinton by name, he added, "If the U.S. government really wishes to move forward in its relations with Cuba, I recommend that it abandon the conditions of a domestic nature that it attempts to impose upon us, issues that only us Cubans are entitled to decide." However, much like Carlos Varela's message when he played for us last Friday afternoon at The New America Foundation in D.C., "La politica no cabe en una azucarera" (Politics don't fit in a sugarbowl), Robert "Kool" Bell tried to draw a line between music and politics, saying, "We con't come to Cuba as politicians. We come as musicians." This sentiment was not lost on the Cuban people themselves who joyously (and voluntarily) turned up in throngs to hear, strut, slide, and line-dance to Kool & the Gang by the thousands. For a Cuban, non-governmental take on the concert, I recommend you check out Irina Echarry's coverage of the concert at The Havana Times. "People laughed, danced and choreographed spontaneously in the middle of the street," she writes, "but -unlike the political rallies- no one had to be summoned. It was one of the most cheerful mass concerts I’ve ever seen in Havana." The site also has a scrapbook of some wonderful photos, like the one above, all taken by Havana Times photographer Yordanka Caridad. There's also some great video of the concert at MSNBC (see above), Reuters (see below), and BBC. Coverage from Cuban TV is available at YouTube here and here. I spent a busy but rich and productive day in Washington, D.C. today before the impending blizzard that is set to hit the city tonight. I was invited down from New York by Paul Wander and Dan Erikson at The Inter-American Dialogue together with Uva de Aragon of FIU's Cuban Research Institute to participate in a brief presentation on my favorite topic, La blogosfera cubana, in an event entitled, "Cuba and New Technologies." While I will revisit that topic again many times in the future at El Yuma, here are a few links to the event. The Inter-American Dialogue site has a pre-meeting summary here. And better yet, C-SPAN showed up and filmed the entire gig. You can stream the entire 1 hour, 21 minute video of the event here (my comments start at 7:40 and go thru 34:25; the Q & A starts at 57:35). While in D.C., Anya Landau French invited me over to her office at The New America Foundation a few blocks away for a real treat (by the way see her excellent report, "Options for Engagement: A Resource Guide for Reforming U.S. Policy toward Cuba"). Carlos Varela (pictured to the right > in a rough photo I took with my Blackberry), in the country on a 21-day artist visa, gave a mini-concert and engaged us an a quick, stimulating Q & A on music, culture, and U.S.-Cuban Relations. While I will have more to say on this topic and especially about his somewhat dismissive comments of Yoani Sanchez in a Q & A after one of his previous mini-concerts two weeks ago here in D.C. at American University (saying something like, "el que vende mas discos no es siempre lo mejor" - just because you sell a lot of disks doesn't make you the best artist), I was impressed with his heart-felt comments and even more heart-felt songs at this event. In the end, the great and sometimes frustrating thing about musicians and artists is that they are good at suggesting and implying a lot, without being forced to choose sides. Though it is indeed hard for Cuban artists to walk that tight rope. 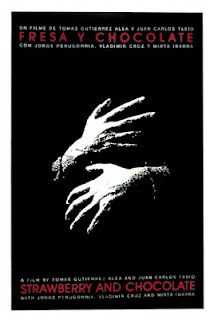 (Landau French has her own incisive and deeply felt post on the concert here). In the past 12 years, since my frist trip to Cuba in the summer of 1997, I've been to the "forbidden isle" perhaps more than 15 times. On every one of those trips I have brought things with me to give to "the Cuban people," friends, acquaintances, and strangers. I started with two or three boxes of donated medicines and multiple bottles of vitamins and asprins. Luckily, I was illegally renting a room from a Cuban doctor who brought me to the office of the director of his hospital to hand over the goods - so as to eliminate the famed desvio ("detour" or pilfering) of donations. Though, I have since learned that giving donations to such a person was perhaps the worst idea of all! Still, I have not been discouraged. Since that first trip, I expanded both my repertory and generosity, and have always tried to deliver my donations directly to their intended beneficiary, without using intermediaries. I have brought scores of letters (back and forth). I have brought cash. I have brought all kinds of magazines - Hola!, The New Yorker, Encuentro de la Cultura Cubana, Muscle and Fitness, PC World, Foreign Policy, Foreign Affairs, and even copies of the dissident publication CubaNet News, etc. (If you're wondering, Hola! was easily in first place with Muscle and Fitness, PC World, and Encuentro competing for second). 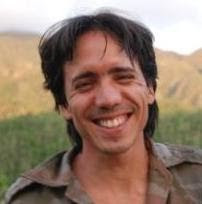 As a fellow blogger myself, I'd be remiss if I did not give special mention to Orlando Lius Pardo and his article, "Guerrilla Blogging: A Virtual Democracy Against All Odds" (he is pictured here to the left and below in living color!) 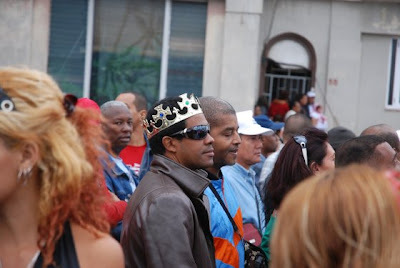 His is one of the best, most comprehensive snapshots of the blogosfera cubana I have yet read. His article is full of insider war stories and anecdotes and, like a good blogger (he has two blogs of his own here and here), replete with hypertext links to many Cuban blogs and blogger portals. While all the articles in the special issue are worth your time, you should not miss the brief history of Cuban rock by the one-and-only Cuban writer Yoss (Jose Miguel Sanchez Gomez - pictured below with is signature "look"). We get a bit of everything here from a guy who has lived through it. Back in August of 2008, I attended an unforgettable death metal party at his apartment in Havana (one that he shares with his mother no less!). Like any such party worth its salt both the cops and his mother were tossing people out by the end! Also, where else can you go to learn the definitions of and fine-tuned differences between repas, frikis, mikis, emos, and metaleros. Que viva la diferencia! I recently discovered the work of Fernando Ravsberg, the BBC foreign correspondent in Cuba. Ravsberg churns out some really good articles and interviews on the usual suspects and topics - los Hnos. Castro, Yoani Sanchez, politics, U.S.-Cuban relations, etc. 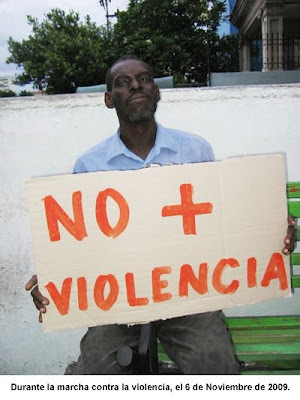 However, in an effort to focus attention on the often ignored struggles and joys of daily life in Cuba for its average citizens (and often in the neglected "provinces," faraway from the overexposed capital city), he also launched a blog, Cartas desde Cuba, two years ago. His first five posts all appeared in a single week in mid-November of 2007. They covered fascinating subjects like the daily struggles to make ends meet, a handfull of Cuban children abandoned by their parents who live quite well at a state-run orphanage, trying to spend a weekend at Varadero when you (like Ravsberg) are a foreigner with a Cuban spouse (back then, Cubans couldn't stay in hotels and foreigners could only stay in them), the underground rock scene and the youth hang-out at 23 y G in Vedado, and corruption, the black market, and the creeping privatization of state enterprises by their "enterprising" employees. His fascination with this Cuba, "beyond the headlines," led to his rich and vivid blog (now two years old). To this we can add the rich and provocative comments his world-wide reading audience have sent in. "In the press we are acoustomed to read, see, or hear about Cuba only when some kind of political event occurs; whether it has to do with Fidel Castro, Cuba's historic leader, or when there is an incident concerning relations with the United States, among other themes. Nevertheless, we know and read little about the day-to-day life of this Caribbean island. "For that reason, our correspondent Fernando Ravsberg ventured out into the streets in order to search for and write about the daily lives of Cubans, sharing his expereinces with you in these 'Cartas desde Cuba.' We also invite you to read the many comments we have received responding to his work during this week." Luckily for us, this week-long experiment went so well that Ravsberg decided to continue blogging into 2008 and 2009. His latest post, "You Are Totally Wrong!" is his 100th. It is highly recommended for its wit and for its focus on Cuban political culture, where respectful dialogue and debate is often a faraway dream. Instead, both government critics and pro-revolution stalwarts tend to attack one another with "verbal violence," refusing to ever really hear what the other is saying. Click above to read the post in Spanish. My translation follows below. My previous post in this three part series, "The Savaging of Yoani Sanchez," described the flood of recent articles in the Cuban press aimed at disqualifying the blogger. Essentially, these articles allege that she is a foreign media phenomenon, completely unknown in Cuba, financed by enemies of the revolution. While it is clear that Sanchez began with a much greater following abroad than she has so far attained within her own country (kind of like the Buena Vista Social Club, come to think of it), none of her critics care to admit that this fact is due primarily to the government's monopoly on mass media in Cuba. By law and by definition, Cuban mass media is Cuban state media. Remember, the national daily Granma is the "Organo Oficial del Comite Central del Partido Comunista de Cuba" (the official newspaper of the Central Committee of the Cuban Communist Party). Indeed, up until last week, the state media had steadfastly refused to even mention her by name, knowing perhaps that the wily Cuban public is often skeptical of what it reads in Granma, and may become interested in "un tal Yohanis" exactly because the government has begun to badmouth her. This is also likely the reason that the article that did attempt to savage her, " Yoani Sánchez: la hija de PRISA" (a reprint of an article first published on-line back in January, 2009) appeared only in the weekly, Spanish-language version of Granma Internacional, not in the national daily Granma. Furthermore, the fact that Sanchez's blog, along with a growing number of the blogs and portals that she is associated with, are "blockaded" by the government and thus inaccessible to the vast majority of the Cuban public did not seem to merit mention by her critics. (Last year on a trip to Cuba I confirmed this when I was unable to access her blog or the portal that houses it, DesdeCuba.com, from a number of Havana hotels). Instead, with a twisted logic, her critics use the fact she is (still) relatively unknown within Cuba (because of this internal "embargo" on the free flow of information) as "proof" that she is a foreign media construction and, it is insinuated, a foreign agent, whose critiques of Cuba's socialist system serve foreign interests and and are not shared by her fellow Cuban subjects, er, citizens. Thus, out of overconfidence, naivete, jealousy, or just a lack of understanding of this new generation and their newfangled gadgets, and in their effort to disqualify the blogger, her critics have willfully overlooked or conveniently ignored the real reasons for her substantial success and rapid rise to international influence to date. 1. David vs. Goliath: The laudatory international media frenzy that initially greeted Fidel Castro in the 1950s (with Herbert Matthews of the New York Times - pictured with Castro above [Fildel's the one with the cigar] - describing him as "an overpowering personality" whose "men adored him"; "he has caught the imagination of the youth of Cuba all over the island," "an educated, dedicated fanatic, a man of ideals, courage, and of remarkable qualities of leadership"), is ironically being replayed here with Sánchez and her “revolutionary” blog. Remember, Batista also attempted to censor the Cuban national media preventing them from fueling Castro's rising popularity within the country - necessitating the foreign media's "infiltration" of the country to get the story out. However, Batista was much less adept at completely controlling a national media (which was still then in private hands) than is the current government, of which the national mass media is an official extension. I was just in the process of updating my blogroll, that list at the right-hand side of the blog where I link to other blogs of Cuba interest. Mine's called "BestBlogs." I guess you could say I "recommend" them, since I do call the list "BestBlogs." However, the usual disclaimer applies - recommendation does not imply agreement. For example, the logo, "Free @ Internet," pasted to the upper left here is used on many blogs connected to the dual projects, Itinerario/Academia Blogger and Voces Cubanas, a weekly blogger workshop and blog portal, respectively, for independent Cuban bloggers usually run out of the home of Yoani Sanchez and Reinaldo Escobar. There are 16 blogs currently collectively housed at the "Voces Cubanas" portal, while the number of such independent blogs in Cuba could easily be double or tripple that. The logo on the right, on the other hand, is from the main portal of another group of young bloggers, lanuched informally by a group of 15 students and professors at the University of Havana, calling themselves simply, "Bloggers Cuba." Notice that they both use the Cuban flag - but in very different ways. Both groups have also been organized for about a year and meet up regularly to share blogging strategies and encourage one another. Of course, there is also much that separates them. Keep reading this new five-part series, "Let a Thousand Flowers..., uh, Bloggers Bloom! ", as I will have much more to say about these and various other blogger movements and internet news sources rapidly flourishing (despite and sometimes because of government repression and/or support) in today's Cuba. So, I "recommend" that you check out both of these portals, while I do not uncritically "endorse" all the content of either. In fact, my list of "BestBlogs," like my list of best friends, I only agree with about 50% of the time. What's the point of talking, debating, reading, exchanging ideas, and dialogando (that word with such a tragic Cuban/Cuban-American history - e.g., dalogueros, Cuban-Americans who dared exchange ideas with the Cuban government back in the 1970s and 1980s and were met with terrorist violence because of it in Miami), if we are already in agreement. I do, however, make recommendations with an eye to the importance of a source's serious contribution to the Cuba debate or if it is sharing of a perspective that is not likely to get much play in the monopolistic corporate media in the U.S. and even less so in the state/party controlled media in Cuba. only to those who own one." In the first part of this series, "Crying Wolf(ette)," I highlighted a series of articles appearing in the Cuban press (in print and on-line) aimed at disqualifying Yoani Sanchez. Without exception, they deploy one or more of a handful of tired tactics traditionally aimed at discrediting any critics of the Cuban revolution. Most commonly, they attack the critic, not the criticism; the messenger, not the message. Official corruption, collapsing infrastructure, an inefficient economic system, lack of freedom of expression, of the press, of association, of assembly, to travel freely abroad, to live where one chooses, to buy and sell one’s belongings (including one’s home or car), to work on one’s own account, not to mention the severe limits on other political, civic, economic, and human rights. In other words, these attacks are a concerted but unsuccessful attempt to change the subject. Cuba’s real problems don’t appear on that long list above and can simply be reduced to this: the fatherland is threatened by an ungrateful, anti-Cuban, skinny computer hacker with a poison pen (ink bought and paid for by Uncle Sam, of course). This elegant graphic comes to us courtesy of the blog of Cuban journalist Norelys Morales Aguliera - Islamia. Luckily, Yoani hasn't taken the bait. She refuses to be dragged down into the mud with her critics, even having the class to express solidarity and understanding with them as fellow bloggers. Instead of being distracted by the noise, er, news, she has kept up her mission of expanding the space for critical dialogue by speaking truth to power, refusing to stop "kicking the darkness 'till it bleeds daylight" - verbally speaking, of course. Some of the best comments that I've gotten so far on this 6-week old blog* have been direct e-mails from readers, some angry and others complimentary. Unfortunately, however much they warm my heart or boil my blood, these direct e-mails never see the light of day. However, I received one e-mail about two weeks ago from an old friend in Cuba, Carlos Alzugaray, a former diplomat, active scholar (see his recent essay, "Continuity and Change in Cuba at 50" here), and a professor of Political Science in Havana, that was quite helpful for me in expanding my still limited knowledge of the blogosfera cubana. Carlos and I have since kept up a healthy e-mail exchange, not always agreeing, but always open to debating and learning from one another. If we were not separated by those pesky 90 miles, we'd also likely share a bottle of ron anejo as we argue over US-Cuban relations. Given the recent rise in the temperature of the debate surrounding the Cuban blogosphere and the flood of personal attacks, innuendo, and basic lack of buenos modales or even el respeto por el derecho ajeno from some bloggers, I think Carlos' note is a good example of respectful, fruitful engagement. With his permission, I'm pasting his initial e-mail here as food for thought and fodder for more critical and respectful debate. I have been following your blog and I cannot help but notice your infatuation with Yoani. No doubt an intelligent, articulate and attractive figure. I think in many ways she reflects what many young Cubans of her generation think. Nevertheless, since you are a scientist and I am one too, I must point out that I find your attention on Yoani excessive and supporting a distorted view of Cuban reality. 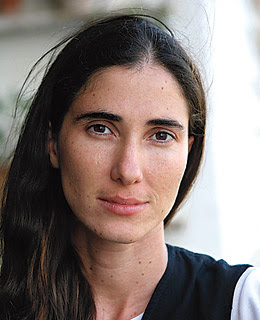 Your blogs give the impression that the Cuban blogosphere begins and ends with Yoani and the group of young people that surround her and follow her, an idea that Yoani and her husband, Reinaldo Escobar, tend to promote. The editorial board of the website CubaEncuentro.com will split off from the parent organization, the Association "Encuentro de la Cultura Cubana." The entire editorial board of the website, as well as a number of the directors of the magazine, Encuentro de la Cultura Cubana, will leave Encuentro and start a new website Diario de Cuba, (http://www.ddcuba.com/), effective immediately. In an editorial dated tomorrow morning, Friday, December 4, 2009, what is easily the best one-stop website for intelligent, professional, trustworthy, well-balanced, and up-to-the-minute news on Cuban politics, culture, and day-to-day life in general in Cuba will split, with the entire editorial board leaving to start a new venture Diario de Cuba. 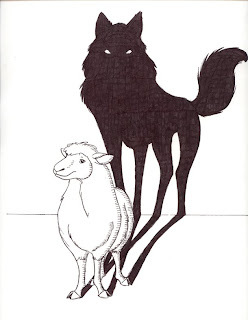 Note: To navegate to the other entries in thies series, "The Savaging of Yoani Sanchez," you click here on Part I, "Crying Wolf(ette)," Sanchez Responds to Critics, "Classy Lady," Part II, "Of Strawmen...," or Part III, "The Reasons Why..."
Is this the sound of the other shoe dropping? You can be forgiven for not having noticed, but while you were eating your Lechón con flan over the long Thanksgiving weekend, the Cuban government clearly changed its strategy in dealing with the independent blogger movement and especially with the most prominent member of that movement, Yoani Sánchez. Of course, October and November were quite eventful in the Cuban blogósfera, featuring a series of audacious guerrilla video maneuvers from La Flaca (first at an immigration office and then inside the Temas internet debate). This was followed by a pair of violent, government-orchestrated crackdowns, both taking place in the streets and aimed at reminding her and her husband, Reinaldo, along with their pesky blogger friends like Claudia Caudelo and Orlando Luis Pardo Lazo (pictured above with Sánchez), that “la calle es de Fidel” – even if he hasn’t been seen on it in more than three years. This was all capped off by Sánchez’s coup of scoring a one-on-one Q&A with President Obama, published on her blog as “Siete Preguntas” on Thursday morning, November 19. However, over the course of the following week, more articles critical and dismissive of Sánchez have appeared in the official Cuban on-line press (and, according to AFP, it seems also in the print version of the Spanish language edition of Granma Internacional) than had appeared there in all of the previous two-and-a-half-years. Enter Achy Obejas and "Inside Cuba: Voices from the Island." Between 1996 and 2002, I did graduate work at Tulane University's Stone Center for Latin American Studies where I specialized in Cuban Studies. Having previously done relief work with Cuban balseros, then just released from the now infamous Guantanamo Bay Naval Base, I was eager to learn more about the history and reality of the country these people had fled - a place they continued to love dearly and where they had left behind many of their most cherished memories and gente mas querida. As I moved tentatively forward on my path to becoming a full-time "Cubanologo," I had the good fortune of meeting and learning about Cuba from a long succession of Cuban professors who were in New Orleans, at Tulane, on academic visas. The long list of these visiting writers, scholars, and artists included Pedro Monreal, Julio Carranza, Wilfredo Cancio Isla (now an intrepid reporter for the Nuevo Herald), Aurelio Alonso, Rafael Hernandez, and the sometime journalist and now full time novelist Leonardo Padura. 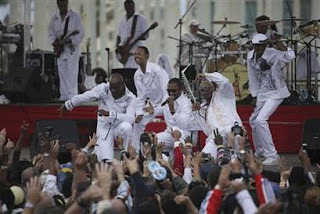 Thankfully, that era of people-to-people, academic, and cultural exchanges seems to be slowly resuming under the Obama administration, what with the recent announcements that the Cuban super group Los Van Van will do 70 shows in the U.S. next year while none other than Kool and the Gang will be performing in Cuba in the coming weeks! Can somebody say, "Celebration!"? 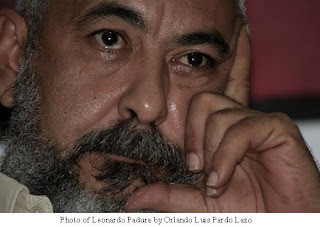 All this is a long winded way of introducing Leonardo Padura's work, as well as his latest novel, El hombre que amaba a los perros ("The Man Who Loved Dogs," Tusquets, 2009), to readers of El Yuma. Padura is best known for his ongoing series of literary detective novels all featuring the Inspector Mario Conde (translated to English as Havana Red, Havana Black, Havana Blue, Havana Gold, Havana Fever, and Adios Hemingway). In fact, Cuba Encuentro recently reported that Padura's next project will focus once again on Conde, in a plot line that will mix the history of Havana's Polish Jews (I have a friend, neighbor, and former landlord here in New York by the name of Isidoro Ptachewich, proud to be 100% Juban) with that of the city's many "urban tribes" of today. Can't wait for that one! From the early reviews I've been able to find (here and here), however, it seems that El hombre que amaba a los perros, is more of a political/historical novel in the tradition of Padura's highly acclaimed (if still untranslated) La novela de mi vida (Tusquets, 2002), than a "whodunit?" detective novel - even if the new book is built around one of the most grizzly and notorious political assassinations of the 20th century: that of Leon Trotsky by Ramón Mercader. "The novel's plot follows Ivan, a Cuban veterinarian and aspiring writer who, after the death of his wife in 2004, turns back the clock to a mysterious episode from his youth in 1977 when he met an enigmatic foreign man who would often walk his gorgeous Russian hounds on the Cuban beach. After running into one another a few times, 'The man who loved dogs' began to open up to Ivan, sharing vivid details about his 'friend's' life (that is Mercader's life) and his assassination of Trotsky in Mexico years earlier. "The Pandora's Box that this elderly stranger opens for Ivan acquaints him with all the sordid and chilling details of the internecine struggles on the international left long erased from Soviet (and therefore Cuban) history. 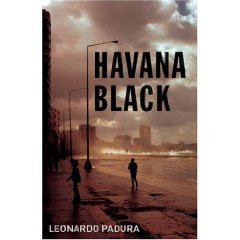 However, all this new information becomes perhaps too disturbing for Ivan as Mercader's story simultaneously raises questions about the many intellectual, cultural, and political discontents that face contemporary Cuba." "In April 2009 at the Summit of the Americas in Trinidad, Obama began his presidency with the promise of a rapprochement towards Latin America. He listened patiently to calls from almost every nation in the Hemisphere to lift the embargo and begin normalizing relations with Cuba. As a result, the hopes of many on the island grew. At that time, the President had already decided to eliminate restrictions that made it difficult for Cuban-Americans to visit their country or send remittances to family members there. Also, academic and cultural contacts were on the path to recuperation and there were talks of a possible reestablishment of direct mail or allowing Cuban access to the North American fiber-optic network. "That is why, when on Oct. 28, the U.S. government declared before the world at the General Assembly of the United Nations that it would not alter the embargo and justified it with the same arguments that eight previous U.S. administrations had used since 1962, hopes faded and many asked: Is a man who decides to sustain the policy of isolation over Cuba, the same young, charismatic man who, promising change, rose to power a year ago? Is the man who accepts a policy aimed at defeating a country through hunger, the same person who won a Nobel Peace Prize? Can this president who so loves to lower tensions, seriously believe that the same Cuban embargo condemned by nearly the whole world, including countries most critical of the Cuban system, is going to force Havana to make changes rather than provoke its deeper entrenchment? What's more, is this intelligent man not capable of deducing that the lifting of the embargo could be exactly the thing that induces the arrival of changes in Cuba?"